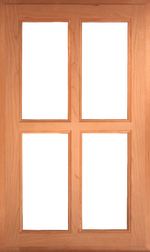 This Cherry door features four openings for your glass, and a Quarter Round Bead on the inside edges of the frame. The #17 round-over edge details the frame's outside edge. Brown plastic stop comes standard with this door to hold the glass in place from behind.